Rated: PG for comic book violence and fun. There’s one man you can’t keep your eyes off of in The Adventures of Tintin, and he’s not even on screen, and this time not even behind it. I’m of course referring to the film’s director, Hollywood wonder-boy Steven Spielberg. His presence looms large in this adaptation of the comic books by Hergé, who, while world-famous, remains mostly anonymous to American viewers, myself included. But its Mr. Spielberg’s camera—how he uses it and how he constantly reinvents the rules of modern cinema (many of which, he wrote)—that remains the constant thrill of Tintin. It’s also the downfall of his film. Mr. Spielberg is no stranger to adventures, and Indiana Jones seems to be in the town over from wherever globetrotting Tintin, a young and peppy journalist with an ache for adventure, must be. But here the craftsman takes on new challenges; not just the added dimension of 3D (something I really only noticed in the weight of my wallet), but going for full-scale animation. The Adventures of Tintin isn’t a classically animated world—Mr. Spielberg used the aide of Avatar director James Cameron, as well as producer Peter Jackson, to use the WETA studios and shoot the whole film in a digital landscape with actors carefully monitored to bring their performances to the cartoonish caricatures. 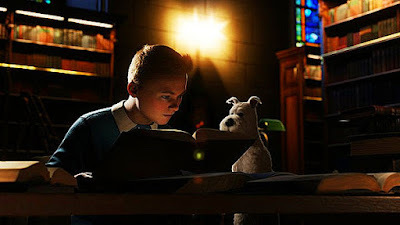 But there’s something lifeless in Tintin, and its not just the odd uncanny valley look of the film’s characters, but its lack of a true adventure spirit, which instead feels calculated and often standard, that the reveals and boyhood adventure that has marked so much of Mr. Spielberg’s career remains absent. 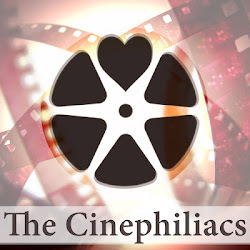 That came as a surprise at least to me, especially considering the talents behind the film’s script, which includes the impossibly strong (and Brtish) trio of Steven Moffat (the BBC’s Doctor Who reboot), Edgar Wright (Shaun of the Dead), and Joe Cornish (Attack the Block). Some of the issue may be that Tintin (Jamie Bell) himself is somewhat of a blank face. Young and peppy, Tintin is too much of a do-gooder with a thirst for adventure but no explanation why, besides the demands of the script. His dog, a white terrier named Snowy, seems to have more definition than any of the hairs in Tintin’s ginger hair. 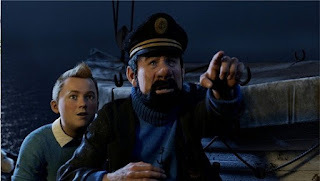 So when Tintin soon takes off following the clues of an old sunken ship and its mysterious cargo, it’s a relief when he crosses paths with the wide and round-nosed Haddock, a sea captain with veins soaked in alcohol and played by Andy Serkis. Haddock is neither id nor ego to Tintin, but his wicked ways give the film’s script a fun humor missing from its pale-skinned hero, even if it shies from any issue related to alcoholism (Mr. Spielberg isn’t remaking Lost Weekend, after all). When Haddock, in either a moment of complete delusion or complete clarity, views a pirate ship crashing through the sands of a desert before seeing himself fighting pirates, Mr. Spielberg finally finds the voice he’s looking for. But alas! Haddock must be redeemed, and the do-gooders must prevail (I’m sure if Dr. Jones ever called himself a do-gooder, he might puke). The film jumps through its exotic locations (in an unspecified time, most likely a pre-war or post-war haze it appears), but the focus is rarely what’s on the camera than how it’s used. Most tradition animated films try and stick to the typical cinematic language we’ve learned through live-action to translate its story and feelings. But Mr. Spielberg sees it instead as release, smashing his camera through windows, under cars, and in all sorts of impossible angles (extreme close-up to wide long shot without cutting? No problem). This all comes into play during the film’s gigantic set piece: a fifteen minute car chase through a Moroccan city, all done in a single “shot,” as Mr. Spielberg builds impossible set pieces (a rush wall of water, a clever hawk, and a sliding hotel) while constantly finding a new way for his camera to follow the flow of the characters. It’s intensely cinematic stuff that’s should give the film a really, really big wow, but it also reveals the essential artifice of The Adventures of Tintin—I cared more about where Mr. Spielberg’s camera planned on going next than the young boys on screen (women are mostly absent on screen, and no character seems to have developed a libido). As the film slowly reaches its end and reveals its MacGuffin (one that might have been much more fun if remained secret to the film’s characters), I found the spectacle of Tintin to be quite that. Mr. Spielberg’s greatest craft has been something not shown on screen: the chills down my spine during Jaws, the tears I poured at the end of Artificial Intelligence, and the giddy sense of adventure during Raiders of the Lost Ark. 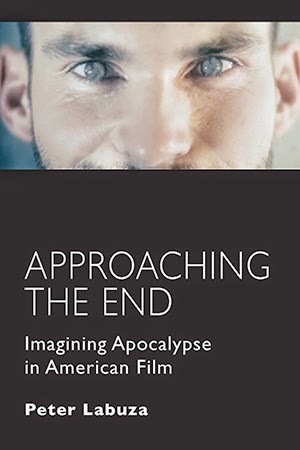 Perhaps that’s why Mr. Spielberg has doubled his chances with a second film this holiday weekend (the WWI tear-jerker War Horse), but there was certainly time when the director need only one film to perfect both spectacle and storytelling.